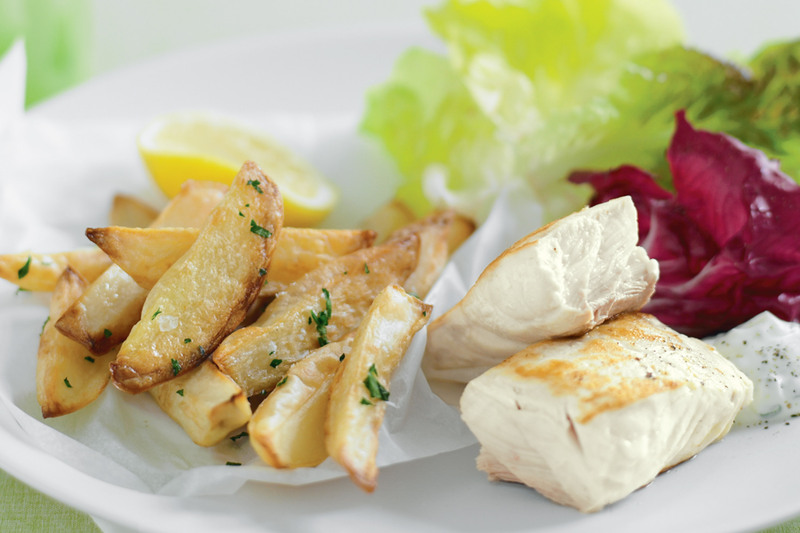 Traditionally high in fat, fish and chips get a healthy makeover here – they’re baked in the oven and come with a low-fat yoghurt dip. Preheat oven to 220°C. Line a large baking tray with non-stick baking paper. Place the potato, in a single layer, on the lined tray. Spray with olive oil spray. Bake in oven, turning once, for 35-40 minutes or until crisp and golden. Meanwhile, combine the yoghurt, chives, capers, lemon rind and 1 tablespoon of parsley in a small bowl. Heat a large frying pan over high heat. Spray with olive oil spray to lightly grease. Add the fish and cook for 2-3 minutes each side or until the fish flakes when tested with a fork in the thickest part. Remove chips from oven. Add the remaining parsley and toss to coat. Divide the fish and chips among serving plates. Serve with yoghurt mixture, mixed salad leaves and lemon wedges. This information is per serve.